So a little bit of back story. Over the summer, I worked for a relative at his office just doing a bunch of different stuff like setting up computers, installing software, troubleshooting, doing inventory, cleaning, paperwork, managing old archives. Just intern type stuff since I'm still only in high school. He agreed to let my buy my own parts so I can build my own PC as long as the total cost was maximum $800. But as what always happens, my budget went up from $800 to $1400. I kind of needed a new PC since my old PC was a pre-built Intel Core 2 Quad from Dell way back from 2009 that was really slow. That PC was horrible at gaming because it only had integrated graphics. The main purpose for this build was gaming, browsing, watching movies, using Plex (transcoding), and doing a little bit of video/photo editing occasionally. My main goal was to be able to play the majority of games at High-Ultra settings at 1080p at 60fps. Second goal was to be able to use this PC without upgrading anything for at least 2-3 years. Third goal was to keep it all under $1400. Last goal was to try to go with a Black/Blue colour scheme and have it look great, not "Gamey" and have it run fairly quiet. I could have not built this PC without this website and all of it's builds as my inspiration. Also the buildapc subreddit was an amazing resource and help along with sites like Anandtech, PCper, Tom'sHardware along with LinusTechTips, AustinEvans and TekSyndicate. Other sites like Johnnyguru, MaximumPC, and Guruof3D were a great help also. I named this build Serenity after the ship from one of my favourite shows Firefly. I couldn't think up of a name until I looked around in my room and saw the Serenity DVD. The pictures were taken with my brother's Sony NEX-5 which is most of the time a great camera except for in extreme close-ups, and dark scenes. CPU: Chose the 4690K because I didn't really need a i7 especially since it wouldn't impact gaming performance. Plus it's one of the best CPUs you can buy without going over $250. It idles around 30°C and under load around at max 60°C in Prime95. I was debating between getting this or the locked 4690 but decided to go with this since if I want more performance in the future I can overclock making the extra $10-20 worth it. My first choice was actually a AMD FX-6300 when my budget was originally $800. It had great performance for the price but it was inefficient and had weak performance per core. I haven't tried overclocking the 4690K yet but I probably will sometime soon. 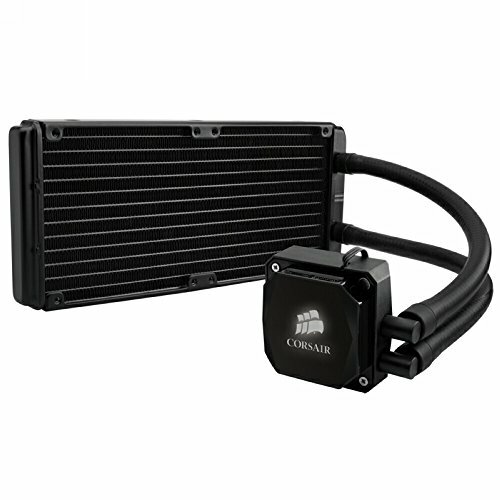 CPU Cooler: Chose the Corsair H100i since it has great cooling performance and looks really nice. First choice was of course the legendary Cooler Master Hyper 212 EVO since it has great performance for cheap but it's huge and looks ugly. I have it in exhaust and what I am pretty sure is push, not pull. The cooler doesn't really get loud under load but in idle, it's noise is noticeable. The noise is just a constant quiet hum. One thing I didn't really like about the H100i is it's short Y-Fan cable and short fan/SATA cable. The shortness made managing the cables a pain. Motherboard: I chose the MSI Z97S SLI Plus primarily because it looked really good and was a combo with the 4690K. I might do SLI down the line and overclock requiring a Z97. My other choices were other MSI mobos and other ASROCK mobos. Gigabyte and ASUS didn't offer any black and blue mobos plus most of them were out of my price range. Another reason I chose this mobo is because of it's Intel Gigabyte Ethernet port which I prefer over something from Realtek since I plan to build a NAS and wire my whole home. Somethings I didn't really like about the mobo was it's placement of front panel ports in the far left of the mobo. Otherwise I don't really have any complaints. 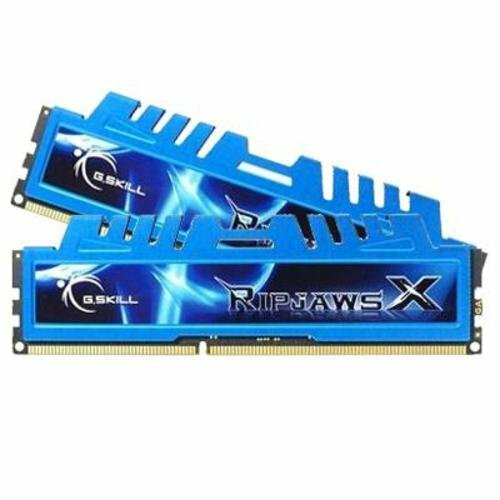 Memory: Chose this set of RAM since it was blue and at the time I bought these parts the cheapest high-quality RAM. The CAS is pretty low at 8 which is good, and the set looks good. Bought 2x4GB to utilize dual channel mode and it's 1600MHz since that is the sweet spot for performance and price at the moment. Was going to buy a 1866Mhz set of RAM that was around $98 but it jumped to something like $120. Other options were other G.Skill sets, and Corsair Vengeance RAM but all were more expensive at the time. 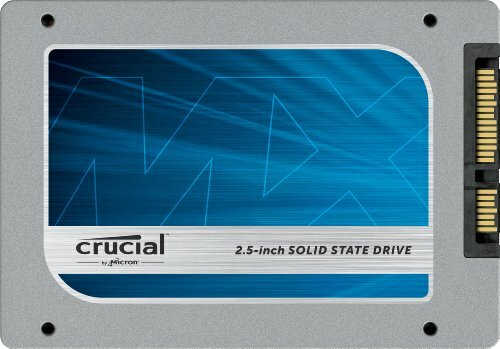 Storage: Bought the Crucial MX100 256GB SSD since it got amazing reviews and was cheap. Original choice was the Samsung 840 EVO 128GB but a few weeks ago there was some story about slowed down performance on older files which made me hesistant to buy it. So I said what the heck, I'll just buy a 256GB SSD and decided on the MX100. It's really fast and I installed my OS and all programs on it except for games. Might dual boot with Mac OS X in the future. I still get surprised by how fast my PC boots up. The average time is about 9 seconds. 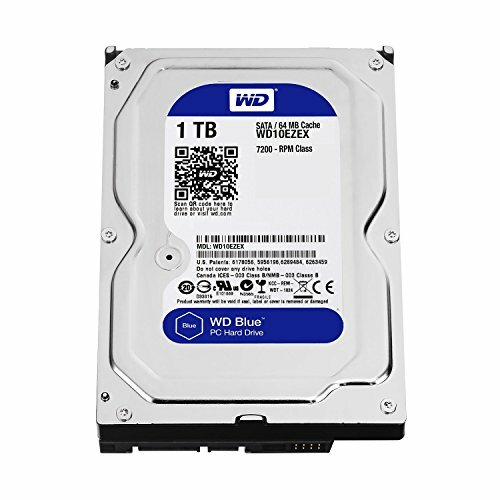 For the HDD, chose a WD Blue 1TB since it has good performance and it is cheap. Could have gotten a Seagate for cheaper but I heard Seagate isn't really reliable. Was going to go with a WD Black but I already have an SSD so why do I need a fast HDD that costs about $20 more especially since it's going to be primarily used for data storage and game installations. 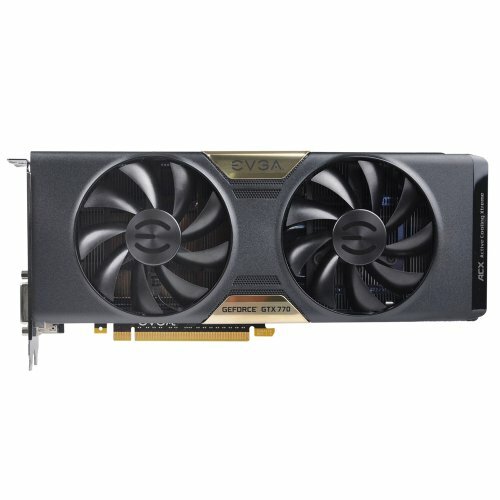 Video Card: I chose the Geforce 770 from EVGA. This was the first thing I bought and I bought it around late August. I am going to upgrade to the 970 using the Step-Up program. My first choice was the Radeon 280X from either ASUS or XFX since it had really great performance and cooling for the price at around $330 at the time. I was going to buy it but at the last moment I decided to go with the 770 since it was on sale at around $320 and was slightly better. Plus I heard that Nvidia's drivers and software was better than AMD's resulting in me going with 770. I also heard that the next x70 was coming withing the next 2 months back in late August so I went with the 770 so I could use the Step-Up program. The 770 idles around 30°C and under load from games like BF3, the max I have seen it go is 55°C. The 770 is a HUGE jump from the Intel graphics I had before. I get plus 60fps on Ultra settings on every game I have tried so far (BF3, Joe Danger 2, TF2, Left 4 Dead 2). It feels so good not having to worry about settings for every game unlike the Intel graphics which couldn't even play 7 year old games at the lowest settings. Back when my budget was $800, my top choice was the 760. 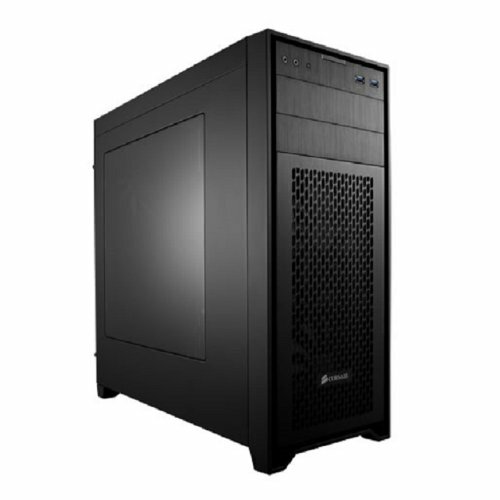 Case: I chose the Corsair Obsidian 450D since it looks amazing and has a pretty good price. It has great cable management and is roomy. My other choices were the Fractal Design R4 and the NZXT H440 but the R4 looked too simple and it's side windows was too small, and the H440 looked too simple also and lacked any optical drive bays. Plus the Black/Blue version I wanted was really hard to find and expensive. Also both have been used by literally almost every build in the last couple of months. The only things I don't really like about the 450D is the 5.25 inch bay covers can not be attached to the case if the bays are in use which kind of ruins the sleek brushed look, and the area for cables behind the mobo is kind of small making it a pain to put on the side panel. Also the front panel connectors were a little short making it a pain to connect them and the front panel/mesh that covers the fans is really really easy to take off which is a problem since I have little kids running around usually. Power Supply: I chose a 750W Gold certified PSU from EVGA. It is a really great PSU with modular cabling, Gold certification and a cheap price. It also had a 10 year warranty which is insane (in a good way). It got amazing reviews from sites like JohnnyGuru. My other choices were either the Corsair CX600M or the RM650. The CX600M was pretty cheap and got good reviews not great while the RM650 got great reviews but was expensive and the reviews were not as amazing as the EVGA PSU. I know 750W is overkill but I might do SLI down the line and I heard that PSUs are the most efficient at close to 50% load plus the PSU was pretty cheap. With the 970 that I hope to upgrade to, the PSU might be even more efficient. 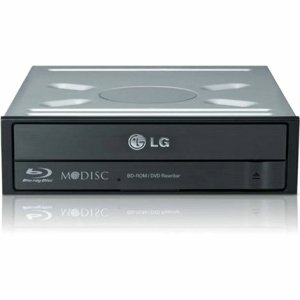 Optical Drive: Chose a Blu-ray reader from LG. Optical media might be dead to most people but I have a Blu-ray collection and I use my PC as a HTPC sometimes so I needed a Blu-ray drive. Could have gone with a writer but it was more expensive. Also I bought it from LG since the ASUS one didn't blend in as nicely as the LG drive with the 450D case. The drive works great but like all drives it is pretty noisy when the drive reads a disc when it it put in. OS: Chose Windows 8.1 Pro even though I hate it with a passion. I love my Windows 7 Ultimate but in order to fully use the SSD's speed I needed to go with 8.1. Plus with a few downloads I can get my start menu back the way I like it. I got this for free since the place I worked at over the summer had a few spare licenses laying around because the majority of people who work there dislike Windows 8 and prefer 7. Case Fans: Chose the Corsair SP120 Quiet Edition Dual Pack because I needed quiet fans for the H100i and it had coloured rings. Could have gone with a Noctua but it is very very ugly and far more expensive than what the benefit would be. They run pretty quiet and look great but I think they emit a very low constant hum. That might be the other fans in the case so I don't know. The fans work well as the max temp for the 4690K has been 60°C in Prime95. I have them configured in exhaust for the H100i in what I think is in a push config. I would have gone with a pull config since it is easier to clean but I think that would result in the fans not being visible inside the build negating the fact that they look cool. One complaint that I have is there are no instructions that come with it resulting in having to Google a few stuff to find out which way is intake. Accessory: I got the NZXT HUE RGB kit since it's pretty cheap and looks cool. I know looking cool doesn't improve performance but dammit I want to show my rig off to my friends. Tons of options and modes and colours. A few complaints I have is the fact that the LED strip itself has fairly weak adhesive resulting in me having to open the case all the time to reapply it. I think I'm going to need to buy some 3M tape from Home Depot to fix this. Also the HUE doesn't come with any instructions on how to use it so for a couple minutes I was getting mad because I didn't know why the colour was still white. Turns out I have to twist the knobs a lot because I though the knobs have a lock so I was only moving the knobs a few degrees. Other stuff: I have a Dell ST2310 monitor that is about 23" and has HDMI, DVI, and VGA with a 1080p resolution. Works great but the base is wobbly and the picture quality itself is okay with okay colours and blacks. The quality becomes really bad in bright daylight. Got the monitor from the relative's office since nobody uses it. Have a standard Dell mouse from old PC and a great Lenovo office keyboard which I think is mechanical since it has pretty thick keys and makes a click when ever I press a key. Have an old Wi-Fi N card that I carried over from my old PC. I am planning to get a new monitor within the next year so if you guys have any suggestions it would be great. Something that the monitor needs to be is non-glossy, IPS, max 24", 1080p, and has to have a HDMI port and a DVI port. It would be great if it had swivel and portrait mode abilities. I am also planning to get a Corsair K70 RGB with Cherry Brown keys and the Logitech G502 mouse. If there are other keyboards and mice you guys recommend, it would be highly appreciated. Not sure what you have more of, photos or FPS. Nice build. Hey its's the blue cousin of my red build. Naturally, I like (y)our part choices. Love your build. Good job on the parts choice and cable management. Love all the pics and your description for your part selection. How did you like building in that 450D? Thanks on the feedback! It was great building in it but putting on the side panel that is behind the mobo takes 2 people for me. So many and many, high quality pics. something very important with rad fans is static pressure. I haven't found a fan so silent with so much static pressure, its jut the perfect balance. With the noctua you get 2.61 at much more silence than the quiet edition. You cant beat that. I do agree with you but Noctua's would have looked out of place in my build and a single one costs about $26 which means about $52 for two. A dual pack for the SP120 Quiet Edition costs about $38. I would have gone with the Noctuas as I heard they are amazing but I don't like the brown and tan colour. in Canada everything seems to be so expensive, I got 2 for 18 bucks each. The black noctuas are nice but just too expensive!! Yes that's the only bad part about living in Canada otherwise it's an amazing country even though I am an 'merican. Born back in the US. My build would have been less than $1300 if I lived in the US. The dollar used to be identical to US up until around March of this year. I actually didn't know there were black noctuas. Thanks! Took a while to type this out! nice build but if you can you should refund your gtx 770 as the gtx 970 costs about the same and gives better performance. 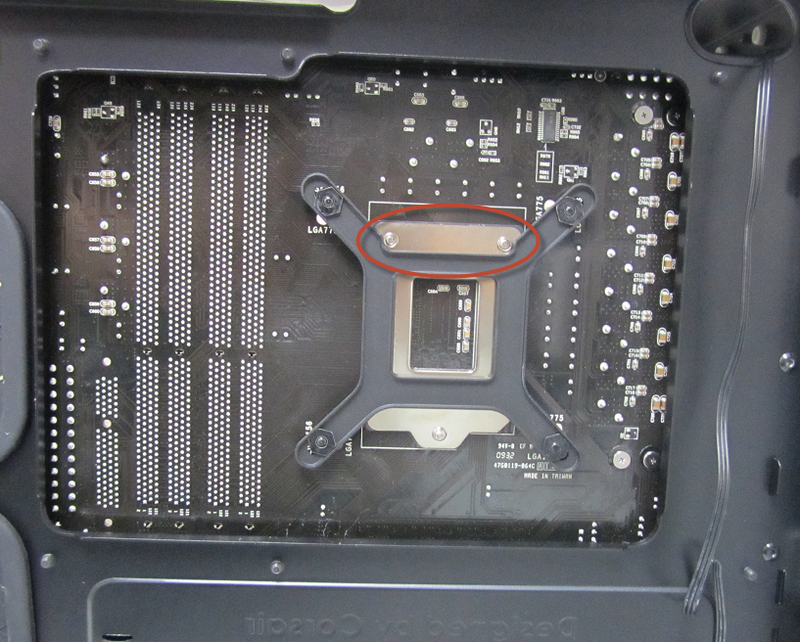 I hate to say it, but you installed the h100i backplate incorrectly, notice the circled ends in the left side? Those should line up where the two screws are coming out of the motherboard. Yes someone over on the builapc subredddit pointed this out. I'm going to try taking it off and changing the plate after I buy thermal paste. Since the thermal paste comes pre applied on the H100i. Good idea, make sure to clean off the thermal paste already on the CPU and contact plate with some isopropyl alcohol before applying the new stuff! Yes I had to do that when I removed the Intel stock cooler after I used it for a text boot outside of the case. I think it's there in one of the pictures. Gratuitous amount of pictures. This pleases me. Yea I think I didn't put enough pictures. Yes and I see that you are Canadian! Thanks! I could have not done it without builds from people like you! Nice job. Also_ excellent writing in your descriptions. It was good to read. In the future do you plan to go down the SLI route, or upgrade to a 9-series card? Would you mind explaining how exactly the NZXT hue works? You mentioned the LED strip isn't sticky. How long is it? Is it just one strip that connects into the hue controller? I plan to upgrade to a 970 through the usage of EVGA's Step-Up program. When the 970 becomes outdated after 3 years I plan to SLI. 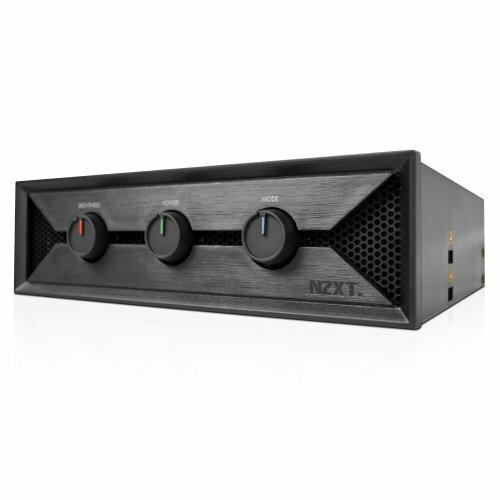 The NZXT Hue is a 5.25 inch bay drive with 3 knobs on the front. The left knob controls Red, the middle controls Green, and the right knob controls Blue. You can mix and match colours for a potential of I think about 16 million colours. If you click the left knob, the brightness changes according to how many times you click it. If you hold and click the middle knob, the LEDs turn off. And finally if you click the right knob, the mode changes. There are waving, flashing, and a lot of other modes. The strip is about 2m so in my case I had to overlap the last bit of the strip over the strip. And yes there is only one strip that comes with it. Good idea with the 970 - they're fantastic. My Dad recently bought the MSI and said it's extremely quiet, very powerful, well built and cool. So much of a no-brainer that I can't wait for pay day haha. Thanks for the explanation of the hue, I think I'll pick one of these up when I get a larger case - currently got an mATX tower (2m will swamp it). Even with a mid-tower there is still a little bit of strip left. :) But I just overlapped it. I really want to like the Obsidian series cases, but I can't stand how the look if you happen to use the 5.25 bays. It's really unfortunate, because the 450d really looks great otherwise. Yes I know, that's kind of really my only big complaint. I saw some guy do a mod where he cut off the metal part from the covers and stuck it on the optical drive. It worked great but I don't want to take a risk with that. You know, I bet Corsair would send you replacements if you asked nicely. They might even have them available as accessories. It's not like you're using them anyways. I would definitely try it. Actually, they don't have any 450d accessories available. But maybe you could get the front cover from one the other cases and try it out. What camera did you use to take such amazing photos? I used a Sony NEX-5. My brother bought it about 3-4 years ago and it still works great. The NEX-5 has nearly the same picture quality as a budget DSLR but the easy usability of a point-and-shoot. nice rig mate +1. what kind of camera are you using? im tired of using my phone for pics. Great cable management. you should check mine out if you get chance. Thanks! I'm using a Sony NEX-5. It's about $500 but I think there is a new version that has come out since my brother bought this camera about 3-4 years ago. It's halfway between a point-and-shoot and a DSLR. I'll be sure to check your build out! I'm not too sure entirely. It was part of a L-shaped corner desk but I didn't have enough space for the whole desk so I just got this part. The cable management is great in the back, how come does it not continue on the side you see? Thanks and I don't seem to understand what you mean. ? I agree but I just wanted to finish it after about a day of building it. Nice build! I'm planning on using this case in my next build and I was wondering if you could tell me how well the NZXT Hue fits with the case, like and inconveniences you had to move around with? Thanks! It's fits pretty well but the LED strip itself needs a moderate amount of overlapping. Plus it doesn't really stick well at near the top so you will probably have to get some tape. The tape can be normal scotch tape but I would recommend double sided or 3M tape. Thank you! This gave me all I needed for my upgrade. You welcome! Just be sure to upvote the build! :) And happy upgrading! How's that board treating ya? I'm looking to swap my ASRock Z97 Extreme4 for your board model sometime soon. Thanks a ton! Yeah, I'm not currently looking to OC yet either. It's pretty good. So far don't have any complaints from it. Only thing is the front port headers are located in an awkward location which may be too far for a case's front port wires. I would go with the FX-6300 and the R9 270X. Graphics cards have the most noticeable impact on gaming performance. I went with the i5 since I do a lot of transcoding, and occasionally video editing along with playing emulators. The 650Ti and the i5 would have worse performance than the FX 6300 and 270X. The FX 6300 is a great chip especially if you are on a budget. PCB is black with just a little bit of really really really dark brown when you shine a light directly on it which in most cases is never even with the NZXT HUE LED lighting at complete white. Yeah I know alot of pictures are good when they show different components and how they fit and so on but when you take multiple pics of the same thing over and over its annoying because you have to go through those to get to the next. Yea I know I kind of did go over the top. Pictures are love, Pictures are life. More pictures means more to fap too. OT: Love the build OP! No your right alot of pictures are great but when you have 20 pictures of the same thing from almost the exact same angle ans some not even in focus theu are pretty much useless. Its like he/she took as many photos they could and put them all on here without reviewing them. To me 10 great photos are better than 100 ****** ones. But thats just me. Quality over quantity my friend. And the pics are still great quality. So why not have both quality and quantity?